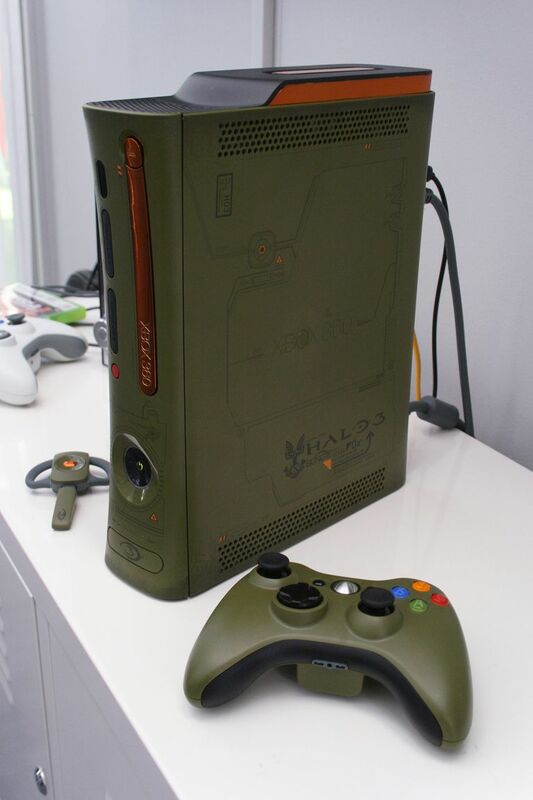 The Halo 3 Special Edition Xbox 360 system was released on September 16th, 2007. It had an MSRP of $399.99, which was more than the premium and core systems, but less than the elite system. What did you get in the package? Quite a bit. Unique Colors - The most significant change in the Halo 3 system is the unique color scheme. It comes in a green case with orange/gold trim on the disc tray and 20GB hard drive, which is meant to represent the armor that the Master Chief wears in the Halo games. There are also Halo 3 logos on the USB door on the front as well as on top of the system, and some other lines and unique artwork on top. HDMI Output - The Halo 3 system also comes with an HDMI port to deliver the best picture and sound possible. When you use the HDMI port, you can even upscale DVDs, which is a nice bonus feature. Unfortunately, the system does not come with an actual HDMI cable, but you can buy one from Monoprice.com for about $6, so it isn't too big of a problem. Special Controller and Headset - You also get a unique green-colored wireless controller and wired headset. They match the look of the system and look quite nice overall. You also get a Play and Charge kit that includes a rechargeable battery pack and a charger cable. Halo 3 Game NOT Included - One thing the Halo 3 system does not include is the actual Halo 3 game. You'll need to buy that separately. All in all, the Halo 3 special edition system was a reasonably solid buy. It was somewhat cheaper than the Xbox 360 Premium system that had everything this system has minus the Play and Charge kit, but for Halo fans, it was worth it. If you are a major Halo fan or collector, this system might be worth hunting down.